China is probing the loan practices of a group of big private sector conglomerates who have been on a high-profile global spending spree over the past few years.And although the review targets only a few of the country’s most politically-connected companies, some analysts see an attempt to increase government control over the role played by the private sector in foreign markets. Chinese authorities say they launched the probe because of worries that highly leveraged overseas deals pose risks to China’s financial system. Officials have already expressed worries over mounting debt among Chinese lenders, some of which may remain hidden by China’s opaque lending networks. According to media reports, the list of companies under review is a relative who’s who of Chinese enterprises. Among those reportedly targeted are Dalian Wanda, which owns the AMC Theaters chain in the United States and has been actively courting deals in Hollywood. High-flying insurance company Anbang, which owns New York’s Waldorf Astoria and Essex House hotels. Also on the list is Hainan Airlines, which bought a 25 percent stake in Hilton Hotels last year and another insurance company Fosun, which owns Cirque de Soleil and Club Med. Over the past few years, China has seen massive amounts of capital moving overseas with companies and wealthy individuals buying assets abroad. Authorities began taking steps late last year to tighten controls. But many big conglomerates view foreign investment as a golden opportunity – given the low global interest rate environment – and worth the risk of highly-leveraged investments. Peking University’s Gillis says it appears the Chinese government is coming to terms with how to effectively regulate private enterprises, companies that behave more aggressively than their state-owned counterparts. But he also sees the move as a further consolidation of power by President Xi Jinping, bringing companies more under the control of the central government. Expensive acquisitions by companies like Wanda and Anbang have thrust China into the global spotlight. But the news and commentary that followed the companies’ mega-deals has not always been positive. People walk past an entrance to the Anbang Insurance Group’s offices in Beijing, June 14, 2017. In some cases, the deals have given China a black eye, says Fraser Howie, author of the Red Capitalism: The Fragile Financial Foundation of China’s Extraordinary Rise. Anbang’s attempt last year to purchase Starwood Hotels is one example, he says. 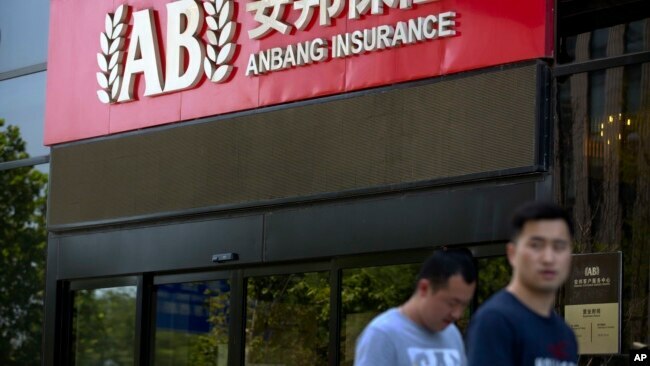 Earlier this month, the head of Anbang was the latest to be swept up in the ongoing financial crackdown. Authorities so far have not said specifically what the targeted companies may have done wrong, if anything. Some analysts argue that the probe is just a part of a process that began six month ago to curtail the flight of capital from China. “If cross-border M&A deals make sense, if they deliver strong returns, then there should be no problem either for bankers or those doing the buying. But, if Chinese groups overpay and get the money to do so from Chinese banks providing risky or underpriced loans, then Chinese regulators have an obligation to step in,” Peter Fuhrman, Chairman and Chief Executive Officer of China First Capital tells VOA in an emailed response. Others see a deeper message about Xi Jinping’s view on the role that private companies should serve broader national goals. Howie says the probe challenges assumptions about the role of private enterprises in China. No health care problem looms larger in China than Alzheimer’s disease. It is the fastest-growing major disease on the mainland, with at least 9.5 million ­sufferers and perhaps as many undiagnosed cases. Almost a million Chinese are diagnosed every year with Alzheimer’s, with the number of new cases expected to rise sharply by around 2030. Of the major diseases in China, Alzheimer’s also has the greatest mismatch between the number of patients and amount of specialised care available. The US has about half the number of Alzheimer’s patients, and 73,000 beds in specialist treatment centres. China has fewer than 200 beds. Alzheimer’s care is a US$250 billion industry in the US. In China, it has barely even begun. The reason for this mismatch is clear. China’s health care system is already under strain to improve the quality of care overall, especially for diseases like cancer and hepatitis. Alzheimer’s is not a top priority, either for government policy or health care companies and investors. But, over the coming decades, no disease will possibly impact more lives in China or possibly cost the country more to treat. By 2050, the number of Alzheimer’s patients in China is expected to reach 45 million, about half the number worldwide. The total cost of treating all of them is impossible to estimate. Alzheimer’s is already the most expensive disease to treat in the US. With the number of cases there expected to double in the next 20 years, US government spending on Alzheimer’s care is on course to become the single most expensive part of the national budget, topping even military spending. China is likely to take a different path, with more spending done by patients and their families, rather than through national health ­insurance. But the near-total lack of ­Alzheimer’s treatment centres, and trained nurses and doctors, is one of the most significant market failures in China’s health care industry. While the government, SOEs and private sector have been making significant investments in old age care, most of it has gone towards flats in retirement communities, for older people fundamentally still healthy and active. There has been little investment in elderly care. The urgent need is to provide specialist centres for people with Alzheimer’s and other chronic diseases that afflict the elderly, like Parkinson’s, arthritis, and post-stroke conditions. In China, Alzheimer’s is still often seen not as a disease but as an inevitable and natural part of ageing, a sad side effect of enjoying a long life. The national broadcaster, CCTV, has of late been airing public service advertisements to raise awareness about Alzheimer’s as a disease. This is the same education process the US and Europe began over 40 years ago. Alzheimer’s, like diabetes, obesity or colorectal cancer, is a disease of economic success. As a country becomes richer and health care standards improve, people live longer. Nowhere has this transformation happened more quickly than in China, meaning an explosive growth in the number of Alzheimer’s cases as has never been seen before. The average life expectancy in China has ­increased more in the past 30 years than in the previous 3,000. China’s life expectancy is still growing faster than that of developed countries. The facts: Alzheimer’s is an incurable disease that afflicts a large number of older people, but not the majority. About 3 per cent of people aged 65 to 74, and 17 per cent of those between 75 and 85, will develop the disease. Those over 85 have a 30 per cent chance of getting it. It is a mystery why some old people get Alzheimer’s and most do not. One interesting correlation: people with higher education levels are less likely to get the disease. The more you use your brain in complex ways, the more you may inoculate yourself against Alzheimer’s. Rural people are more susceptible than city-dwellers. With a larger percentage of Chinese living in rural areas, the percentage of over-80s with the disease may end up higher than in the US, Europe or other more urbanised Asian societies of Japan, Korea, Taiwan or Singapore. Women are more likely to get Alzheimer’s, as they live longer on average. Despite billions of dollars spent on scientific and pharmaceutical research in the West, there are no drug or surgical treatments for Alzheimer’s. Brain chemistry and biology make developing a drug for Alzheimer’s difficult. Despite this, there have been remarkable successes in Europe and the US, especially in the past 10 years, at care facilities managed by specially trained nurses and doctors. They work together to slow the progress of the disease in patients, through physical therapy, psychological counselling, special equipment to improve memory and mobility, one-on-one assistance, and a safe living environment designed for the care of people gradually losing their ability to think, speak and function. The result: Alzheimer’s patients in Europe and the US now live twice as long after diagnosis than 30 years ago, an average of eight to 10 years. Dozens of US and European-listed companies are focused on research and specialist Alzheimer’s care in nursing homes and clinics. China has none. Traditionally in China, more money has been spent on children’s education than on medical care for older people. But, as Chinese live longer, the way money is spent across three generations is likely to change. The grandchildren of people in their 80s will have usually already been through college and are working. That leaves more money, both in the hands of older people and their children, to provide more high-quality care for those at the end of their lives. How should China build its Alzheimer’s treatment infrastructure and bring it quickly up to global standards? The biggest need will be providing care to those with average family income and savings levels. If there’s one advantage to getting a late start, it’s that China can learn from the mistakes of, and adopt the best ideas developed in, the US, Europe and Asia. Japan, for example, is not only building specialist nursing homes for Alzheimer’s patients in the final years of their lives, but also community centres for those still living at home or with relatives. Home nursing care is expanding in the West, ­improving and lengthening the lives of Alzheimer’s patients. Home nursing is still at a very early stage in China, but it is the fastest growing industry and largest source of new jobs in the US. From little spending now on specialised Alzheimer’s care, China will certainly grow into the world’s largest market for it. Alzheimer’s care will also ­become a huge source of new employment in China. It’s hard to think of a business opportunity in China with better long-term investment fundamentals than specialised Alzheimer’s care. But the greatest return on investment would be in limiting the suffering of Alzheimer’s patients and their families.